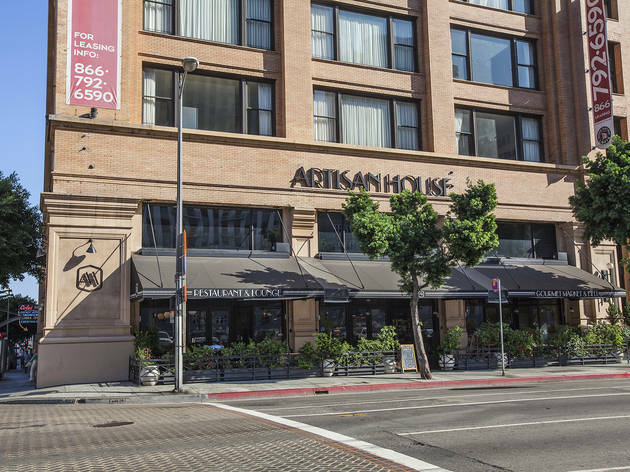 Located in the historic Pacific Electric Lofts building, Artisan House is a sprawling restaurant, bar, deli and gourmet marketplace. While the restaurant boasts lunch and dinner items, skip the fuss and check out the happy hour from 3-6pm on weekdays featuring well drinks, beer, house wines and plates such as Baja fish tacos, mussels and (a full size) margarita pizza—all for $5. On the weekends, rub shoulders with locals and enjoy a boozy brunch with bottomless mimosas. Such a great find in DTLA but sad to hear it closed! I love the concept of the market and the restaurant. They seemed to have a great menu of options for everyone as well as an awesome interior. I remember specifically I got their hot stone steak where it was a big steak on a hot stone and various side dishes - amazing! 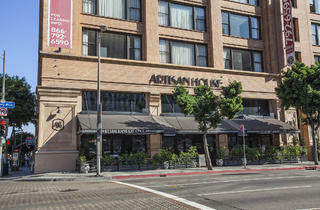 Artisan House is a great restaurant in downtown LA! I recently tried their falafel macaroons which were outstanding. It's two falafel balls with hummus in between and you get a whole plate of them. Very tasty! Looking forward to going back and trying some more of their dishes.